On the 15th (Mon), pause for some serene contemplation at Church of St. Alexander Nevsky and St. Nicholas. For traveler tips, maps, more things to do, and more tourist information, you can read our Tampere attractions planning site . Budapest, Hungary to Tampere is an approximately 7-hour combination of flight and train. You can also do a combination of train and flight; or drive. Traveling from Budapest to Tampere, you'll lose 1 hour due to the time zone difference. Expect slightly colder temperatures when traveling from Budapest in April; daily highs in Tampere reach 8°C and lows reach -1°C. Wrap up your sightseeing on the 16th (Tue) early enough to travel to Akaslompolo. On the 17th (Wed), take an exotic tour of a safari tour and then head outdoors with Seven Fells Up. For photos, reviews, maps, and more tourist information, read Akaslompolo travel route website . You can do a combination of flight and shuttle from Tampere to Akaslompolo in 5.5 hours. Alternatively, you can do a combination of train, flight, and shuttle; or drive. Expect little chillier weather when traveling from Tampere in April: highs in Akaslompolo hover around 3°C, while lows dip to -4°C. Wrap up your sightseeing on the 17th (Wed) to allow time to travel to Helsinki. Get some historical perspective at Rock Church and Kamppi Chapel of Silence. 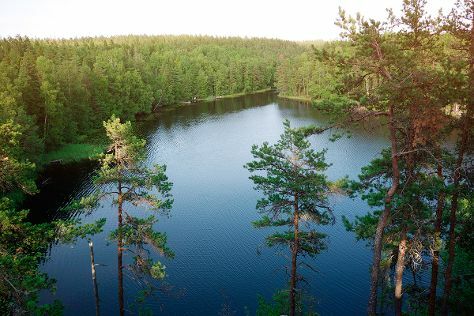 When in Helsinki, make a side trip to see Nuuksio National Park in Espoo, approximately 46 minutes away. The adventure continues: learn about all things military at Sea Fortress Suomenlinna, pause for some serene contemplation at Helsinki Cathedral, get engrossed in the history at Seurasaari Island and Open-Air Museum, and relax and rejuvenate at some of the top local wellness centers. For photos, traveler tips, reviews, and tourist information, you can read our Helsinki road trip planner . Traveling by combination of shuttle and flight from Akaslompolo to Helsinki takes 5 hours. Alternatively, you can drive; or take a bus. Prepare for somewhat warmer weather when traveling from Akaslompolo in April: high temperatures in Helsinki hover around 9°C and lows are around 0°C. Finish your sightseeing early on the 20th (Sat) to allow enough time to travel back home.